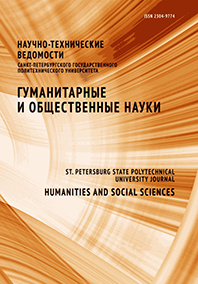 Busurina Ekaterina V. Chuykina Nataliya V.
The linguistic persona occupies one of the central positions in modern humanities in light of the anthropocentric approach. This article is aimed at identifying the characteristic cognitive features in the portrait of a linguistic persona as a part of virtual communication. The main approach to investigating this problem was the structural and semantic analysis of the cases of language games in computer naming using the materials of russian and russian-speaking estonian computer communities. The material for the study was selected by continuous sampling from about 1500 nicknames of LiveJournal users on the internet. The paper presents a typology of language game methods used in generating computer names. The written form prevails in virtual communication, consequently, it involves methods of graphic game and language-graphic game as well as proper language game. The following language game methods proved to be the most frequent: using graphic and numerical symbols, merging, reduplication, polycodification, combining the real user’s name with a definitive, playing upon the figurative meaning of the real name, gender inversion, producing non-existing words according to productive word-building patterns, styling to resemble a foreign word, involving precedent names, complex semantic transformation. The analysis of all abovementioned methods allows characterizing the linguistic persona as creative, with a desire for self-expression. Linguistic creativity is closely connected with the attractive function in computer names. The authors of nicknames use irony, self-irony, appraisal and expression in order to attract the attention of the addressee. Language game methods involve mainly the materials of the native language, though the english language is also popular. The use of the estonian language is natural in estonian virtual space. on the whole, language game methods in computer naming in virtual space of european russia and estonia have demonstrated universal cognitive models involving attractive function of computer names. The results of the research may be used in creating a cognitive portrait of the linguistic persona and in the subsequent cognitive modeling, including modeling under virtual reality conditions. The materials of the paper may contribute to courses on lingvopragmatics and onomasiology.